In it, Green, a longtime propagator of the "Islamophobia" myth and open foe of the freedom of speech, says that Ahmed calls for a "pluralist identity" in Europe and "uses the Spanish term la convivencia to capture this strand of European identity and lifts up Jewish, Muslim, and Christian co-existence and cooperation in historic Andalusia as an example of this pluralist model." 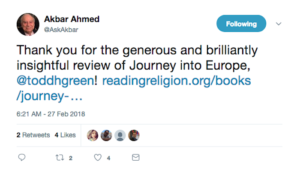 He praises Journey into Europe because "it does not censor perspectives on Muslims that might give the reader pause concerning the realization of a New Andalusia," but this just turns out to be another spurious claim to Muslim victimhood, highlighting "the anger Europe's Muslim youth sometimes feels toward the majority population, particularly in light of policies that contribute to their marginalization and alienation in countries like Britain." Yes, of course, it's all Britain's fault, as it is always the fault of the Infidel. The dhimmi, as these covenanted peoples were called, were granted religious freedom, not forced to convert to Islam. They could continue to be Jews and Christians, and, as it turned out, they could share in much of Muslim social and economic life. In return for this freedom of religious conscience the Peoples of the Book (pagans had no such privilege) were required to pay a special tax — no Muslims paid taxes — and to observe a number of restrictive regulations: Christians and Jews were prohibited from attempting to proselytize Muslims, from building new places of worship, from displaying crosses or ringing bells. In sum, they were forbidden most public displays of their religious rituals. So much for a "pluralistic identity." Also, historian Kenneth Baxter Wolf observes that "much of this new legislation aimed at limiting those aspects of the Christian cult which seemed to compromise the dominant position of Islam." After enumerating a list of laws much like Menocal's, he adds: "Aside from such cultic restrictions most of the laws were simply designed to underscore the position of the dhimmis as second-class citizens." If Muslims, Christians, and Jews lived together peaceably and productively only with Christians and Jews relegated by law to second-class status, then al-Andalus has absolutely no reason to be lionized in our age, and it is revealing that Akbar Ahmed and Todd Green are lionizing it anyway. Whatever the Christians and Jews of al-Andalus accomplished, they were still dhimmis. They enjoyed whatever rights and privileges they had not out of any sense of the dignity of all people before God, or the equality of all before the law, but at the sufferance of their Muslim overlords. Is that the New Andalusia that Akbar Ahmed and Todd Green want? Note also that the book is published by the pro-Muslim Brotherhood, Qatar-funded Brookings Institution. 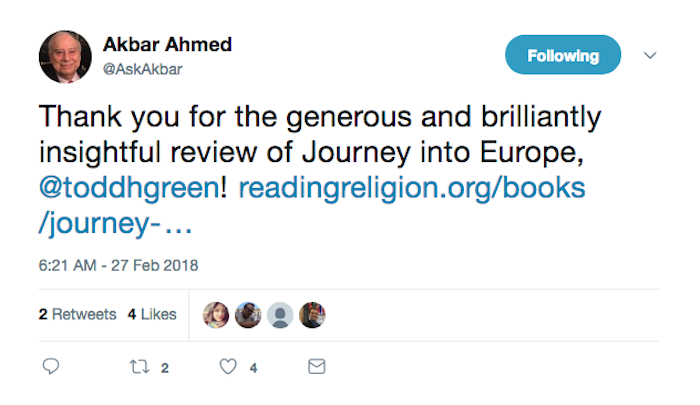 One of the greatest strengths of Journey into Europe is that it does not censor perspectives on Muslims that might give the reader pause concerning the realization of a New Andalusia. In addition to presenting stories of Muslims collaborating and cooperating with the non-Muslim majority for the common good, Ahmed also tackles sensitive topics pertaining to Europe's Muslims, including instances of anti-Semitism, cases of foreign fighters joining ISIS, and expressions of anger or resentment toward the majority population.